PARIS, France (NBC) – Firefighters are on standby in case Monday’s fire that damaged parts of Paris’ Notre Dame starts again. With the loss of the cathedral’s roof, the structure is unstable, and there’s a fear among French officials that there could be a partial collapse. The cathedral of Notre Dame still stands, but without her elegant spire, burned away by a devastating fire. The heat kept building and rising until the spire came crashing down into the church’s interior, fanning the flames even further. Firefighter announced they’d manage to save the structure, Notre Dame would survive. And they said major works of art and relics, including the Holy Crown of Thorns, were saved. Around 100 firefighters are on standby in case the fire starts again. 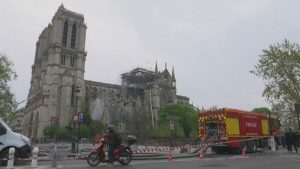 But the big concern right now, according to French officials, is that once pieces of this cathedral had been removed, especially the roof, that there could be further shift and that it’s not over yet.